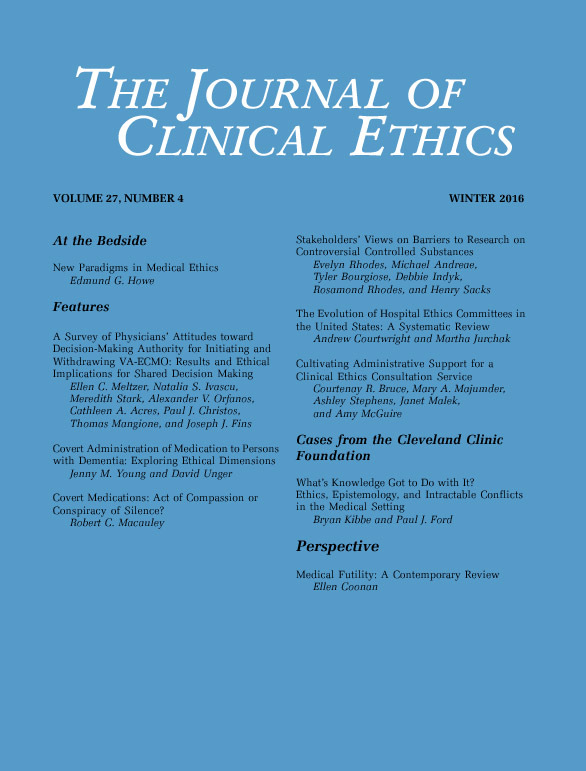 Here are three relevant articles from the latest Journal of Clinical Ethics (Winter 2016, Volume 27, Number 4). Objective: Although patients exercise greater autonomy than in the past, and shared decision making is promoted as the preferred model for doctor-patient engagement, tensions still exist in clinical practice about the primary locus of decision-making authority for complex, scarce, and resource-intensive medical therapies: patients and their surrogates, or physicians. We assessed physicians’ attitudes toward decisional authority for adult venoarterial extracorporeal membrane oxygenation (VA-ECMO), hypothesizing they would favor a medical locus. Design, Setting, Participants: A survey of resident/fellow physicians and internal medicine attendings at an academic medical center, May to August 2013. Measurements: We used a 24-item, internet-based survey assessing physician-respondents’ demographic characteristics, knowledge, and attitudes regarding decisional authority for adult VA-ECMO. Qualitative narratives were also collected. Main Results: A total of 179 physicians completed the survey (15 percent response rate); 48 percent attendings and 52 percent residents/fellows. Only 32 percent of the respondents indicated that a surrogate’s consent should be required to discontinue VA-ECMO; 56 percent felt that physicians should have the right to discontinue VA-ECMO over a surrogate’s objection. Those who self-reported as “knowledgeable” about VA-ECMO, compared to those who did not, more frequently replied that there should not be presumed consent for VA-ECMO (47.6 percent versus 33.3 percent, p = 0.007), that physicians should have the right to discontinue VA-ECMO over a surrogate’s objection (76.2 percent versus 50 percent, p = 0.02) and that, given its cost, the use of VA-ECMO should be restricted (81.0 percent versus 54.4 percent, p = 0.005). Conclusions: Surveyed physicians, especially those who self-reported as knowledgeable about VA-ECMO and/or were specialists in pulmonary/critical care, favored a medical locus of decisional authority for VA-ECMO.